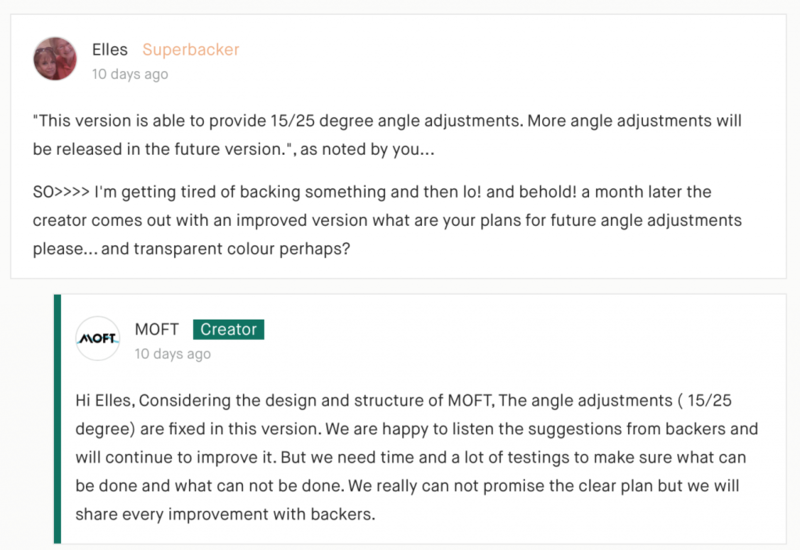 MOFT Laptop Stand Review [Kickstarter] — Worth it? MOFT is a new laptop stand that’s easy to install and use. It’s designed with adhesive and low-grade magnets to stick to the underside of a laptop. In this article, I am going to explain the things that you need to know before supporting this project. MOFT is portable, and has 2 height settings to improve posture and reduce neck pain. The stand is thin, lightweight and easily folds flat. To store it, you just fold it, and to use it you simply unfold it. It sounds like innovation in technology, worthy of backing. But, there are a few things you should know before you make the decision to purchase. Review and Discussion — Is MOFT Worth it? One of the first things that you’re going to notice about the world’s first invisible laptop stand is that it’s not invisible. It’s designed to look like it’s part of the computer, and make it less noticeable: seamless, not invisible. Their quote was “Good design is invisible”. Just so you know, there are a variety of portable laptop stands, such as this one here. MOFT stands come in a variety of colors to match your laptop. That’s great and all, but they forgot one color option that seems obvious: clear. Clear is what comes to mind when we read “invisible laptop stand”. Several backers have suggested it, and the company has later stated that they’ll introduce a clear option on the next campaign. The message posted by backer Elles. There are two height adjustments for the stand. One is low, and one is a pretty steep angle. Backers have suggested more height settings so much that the company will be introduced on the next campaign. However, for this campaign, you’re out of luck. The stand only fits laptops and tablets up to 15.6’’. If you have a 17’’ or a 19’ laptop’, it’s not going to fit, and it definitely won’t be stable. It’s also worth mentioning that it was originally designed for and tested with MacBooks. One of the most crucial features of the MOFT laptop stands is the adhesive system used to keep it in place. The glue is re-useable and enables you to attach and remove the stand multiple times, which is a nice feature. However, the adhesive wears down over time. It’s claimed to use it around 100 times. If you rarely or never remove the stand, no problem. But, if you share the stand or remove it frequently, it’s likely that you will quickly become disappointed by this adhesive. It was tested to withstand 150 degrees Celcius for 8 hours. So, if your computer runs hot, or if you work more than 8 hours a day, it may reduce the effectiveness of the glue. Because of the adhesive system, the laptop stand can’t be used on any laptop with vents or fans on the bottom. The system will cover the vents and prevent air flow. This can cause catastrophic problems with the computer system, like overheating. You can’t attach the stand to anything other than a flat surface, either. So, if your laptop has nubs, legs, or anything else on the bottom, it’s not recommended that you use the MOFT laptop stand. So, these are some pretty big oversights that the company seems to recognize. The next campaign will have options for computes with vents or fans on the bottom. So, is the MOFT laptop stand worth it? Honestly, that’s going to be entirely dependent on your needs. If you own a 11’’-15’’ MacBook, like the colors that this stand comes in, and don’t mind having 2 height settings, this actually looks like a cool product. Myself, I would have to wait until the next campaign because I own a 17’’ HP laptop with vents on the bottom. Plus, I want that clear stand with all the adjustments. This campaign is now funding on Kickstarter. Check for deals. Finally, an invisible laptop stand! Thin, sleek, seamless, and affordable!